I apologize for the lack of content for the past two weeks. I've been super busy with work and other things. And besides, it's hard to come up with a lot of content when you're trying to dig yourself out from a blizzard. I started this year's first batch of winter sowing today. 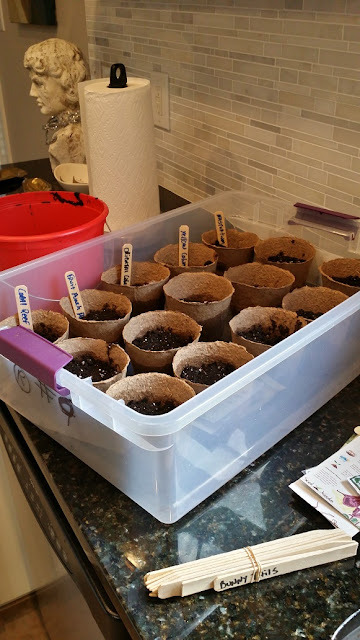 I decided to try those compostable, peat pots versus styrofoam or plastic cups and this year I am using a soil-less, seed starting mix. 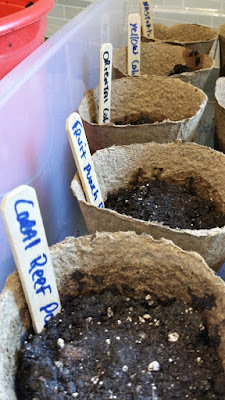 Besides being able to plant them directly in the ground, I'm also hoping the peat pots will help with maintaining moisture when the weather heats up. If you'd like a little more information about what Winter Sowing is, check out the WinterSown website. If you can remember, last year's attempt at using a potting mix and planting directly into my winter sowing tubs was a flop. I'm not going too bonkers with perennials, as we are putting the house up for sale in about 6 weeks (eeek! ), but mostly I am doing this for science to see what combination of growing medium and container works best. Here, I have mostly columbines, poppies, and nasturtium. These perennials need the longest stratification time in the cold weather. I started one other tub along with this one which had some borage and Giant from Italy Parsley. I remember last year I didn't winter sow the parsley and I was sorry for it because the seeds didn't sprout when I planted them later. I sure did miss that parsley last year! I'm going to winter sow some more of it in March, as my previous notes weren't clear on whether I started it in January or in March. Oh well, we're almost into February, so it's not that far off anyway! Smart lady, getting a head start on the garden! Thanks Lynn! Winter sowing is so neat, you just plant the seeds in "mini-greenhouses", set them outside, snow-and-all, and let Mother Nature do the rest. These seeds will sprout when they know it's the right time, which will be around April.